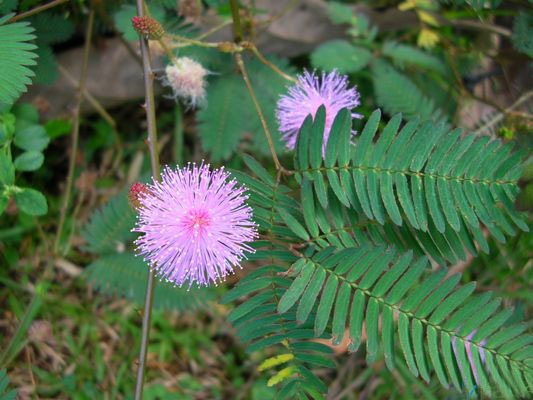 Mimosa tetrandra Humb. & Bonpl. ex Willd., Mimosa pudica L. var. tetrandra (Willd.) DC., Mimosa unijuga Duch. & Walp., Mimosa pudica L. var. unijuga (Duch. & Walp.) Griseb. M.pudica is a diffuse undershrub, 50 to 90 cm. high. The stem and rachis are clothed with prickles; the leaves are bipinnate, pinnae 2 to 4, digitatively arranged, with 10 to 20 pairs of leaflets; the flowers in pinkish globose heads; the pods, small, flat, straw-coloured, with many bristles; the seeds, 3 to 5. Problems of the urinary tract, including stones, to relieve asthma and diarrhea (root decoction); swolen areas involving glands and in hydrocele (leaf paste); in dressings for sinus and also as an application for sores and piles (leaf juice); hemorrhoids (leaf juice and plant); against itching, relieves scabies patches, fistula (plant). Do not use in pregnancy or nursing.. The dried plant is reportedly toxic to cattle.